I have fond memories of BioShock and its good story, stunning graphics, and fun gameplay. I played Ken Levine’s last game, BioShock: Infinite, hoping it would live up to the original. After finishing Infinite and its Burial at Sea DLC, I considered how the philosophies of Levine’s games differ — and why Infinite is an intellectually unsatisfying experience. The fictional cities in BioShock and BioShock: Infinite are extensions of the philosophies of their founders. In the original BioShock, Andrew Ryan’s underwater city Rapture recalled the objectivism of Ayn Rand, only this paradise of the individual had fallen — the one place on Earth with “no gods or kings, only man,” but man’s failings had not been checked at the door. A classic utopia scenario, Rapture’s flaw was assuming that an economic system based on glorifying the individual could overcome the baser instincts of human nature. Ryan would have done well to read Jefferson and Madison, who saw the virtue of the populace as essential to the preservation of liberty in society. The difference between the Founding Fathers and Ryan lies in the former’s belief that liberty and license are not the same thing. In Rapture, the supermen and superwomen of tomorrow succumbed to a madness born of envy and license. Genetic experimentation led to addiction to the supposed wonder drug ADAM. As a result, unwanted children were pressed into service as “Little Sisters” to harvest and recycle ADAM from the dead bodies scattered in Rapture. 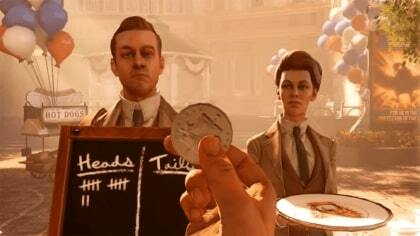 BioShock: Infinite appears to start the same way as its predecessor. A man enters a lighthouse that takes him to a mysterious city. The city is not Rapture under the ocean in the 1960s but rather Columbia, high above the clouds in 1912. Nevermind how a city floats; “science” is the answer that’s given, but it’s quite a cheerful sight. No blood or corpses like in Rapture — Columbia appears to be another happy city in America at the turn of the century. Yet there is more than meets the eye about both this place and your character, private detective Booker DeWitt. The city’s shiny exterior hides a rotten core, built on the excesses of industrialism, violent racism, and a cult-like devotion to the city’s founder, Zachary Comstock. The “protagonist” Booker turns out to be the alter ego of Comstock, your nemesis for most of the game. Your mission in Infinite is to right a wrong you did many moons ago — to save your daughter from Comstock’s clutches — a situation that came to pass due to your pride as well as guilt and despair over past transgressions. What could have been an incredible tale of redemption becomes a depressing exercise in condemning a man to death for his sins. Gameplay shows how BioShock and BioShock: Infinite part ways. In order to escape Rapture in BioShock, your silent protagonist first has to survive, and that means using the drug that helped drive the city mad. The edge ADAM grants you in combat requires you to constantly obtain more from the Little Sisters. Here, choice plays a role, for the player could either rescue or kill the zombie-like carriers for a lesser or greater amount of ADAM. As your enemies grow more numerous and more dangerous, it could be tempting to rationalize the deaths of Little Sisters. (Though truth be told, on the lower difficulty levels it didn’t really matter what you decided. You just thought it did.) In any case, the more “good” or “bad” you are in relation to Little Sisters determines whether you flee the city or attempt to become its new master. The philosophy of BioShock is clear: doing good may not yield instant gratification, but the alternative can lead to a worse place than before. In contrast, everything about Infinite’s gameplay is a case of serious deja-vu for the doomed protagonist Booker, who killed many Indians during the American frontier wars and violently broke factory strikes as a Pinkerton agent. Booker’s past is brought back to haunt him by acquaintances old and new. Even his drinking habit gets revisited by a new dependence on a wonder drug known as “salts,” which grant Booker powerful combat abilities. The deeper into the story one goes, the more it feels like a bad dream, as Elizabeth, the woman you rescue, can open portals to alternate realities, known as “tears.” In order to survive this dream, you have to gun down countless police and militia who are merely trying to keep their city safe. When you get mixed up in a revolution and start shooting Irish and black freedom fighters, there seems to be something off about the whole situation. Perhaps that is because choice is mere window dressing in BioShock: Infinite. The grand twist in the first BioShock was that your most significant choices up to the reveal were not your own. Even so, BioShock was about our choices defining us. Infinite’s twist is that all the choices that matter were made before the game began. Booker has made bad choices throughout his life, bringing pain and suffering to all in his path. His attempts at “redemption” are a lie he keeps telling himself. In the first BioShock, there are different endings based on the morality of your in-game actions. Infinite, however, declares there is only one way the game can end. The Burial at Sea DLC attempts to tie Columbia and Rapture together but does little to change Infinite’s nihilistic tone. Elizabeth, the Burial at Sea protagonist, must die before the story’s done, not knowing the results her actions will yield. Levine has said he doesn’t set out to write a story for any particular agenda. Levine deserves credit for writing characters who are interesting rather than seeking to please whichever interest groups are in vogue. He certainly achieves that — there’s no question that the Lutece twins, Booker, and Elizabeth are beloved by fans. But what is BioShock: Infinite trying to say if choice is meaningless? Through Infinite’s tale of amnesia, madness, death, and despair, the player learns that attempting to do good is folly. Death for the protagonist is the only way peace can be secured; you can’t see Booker and Elizabeth ride off into the sunset. I almost wonder if Infinite’s nihilistic ending is a sly statement about the huge amounts of time gamers spend with their favorite pastime. In a way, the only way to stop the madness of Infinite is to stop playing the game. As much as “player choice” may be a tired or poorly executed game mechanic, the fact does not change that we are human beings who can and must choose. At best, Infinite warns the player not to be Booker. According to Thomas Aquinas, Natural Law can be discerned by reason, so one’s path shouldn’t be regarded as entirely a result of chance, environment, or fate. If anyone is doomed, it is the person living an unexamined life. Booker DeWitt would seem to fit the bill. He’s not concerned with good or bad — he’s the guy with the gun. In light of that, the takeaway from BioShock: Infinite is simple (forget trying to explain the rabbit holes of different dimensions). Booker’s unexamined life makes him a slave to his passions, and refusing to face his faults leads him to use religion as yet another excuse for his bad behavior. There is perhaps a bigger puzzle than the meaning of Booker and Elizabeth’s tale: what caused critics to fall in love with BioShock: Infinite in the first place? The combat mechanics are similar to those in the first game, but the enemies in Columbia are a far cry from the mutated freaks of Rapture. Wreaking mayhem in the form of bloody head shots on the poor schlubs in Columbia gets tiresome after a while. It’s quite ironic that some critics who look down on Call of Duty players were satisfied when Infinite ramped up the shooter elements to provide countless enemies to mow down along with weapons, shields, and powers with which to do so. Is Infinite a great game because it tells a postmodern fairy tale, where there are no heroes and no truth, only a cruel universe? Is it a great game because it’s packaged as a gung-ho jingoistic shooter but is, in reality, a deconstruction of the dark side of American history seen through one troubled man’s eyes? While some might see such ideas as claims to fame, I think it was the quasi-philosophical feel of Infinite that captivated many critics. Much like the thought coming out of most modern liberal-arts philosophy departments, Infinite tends to confuse rather than enlighten. In the game’s second act after multiple “tears” are opened and entered, the story’s logic of worlds within worlds is reminiscent of Inception, a movie many loved but couldn’t understand. Since philosophy literally means “love of wisdom,” an “intelligent” game should give us something tangible to take away from the experience. The first BioShock possessed a clarity of vision that accomplished this, but Infinite ultimately wasted excellent characters by embracing muddled storytelling.